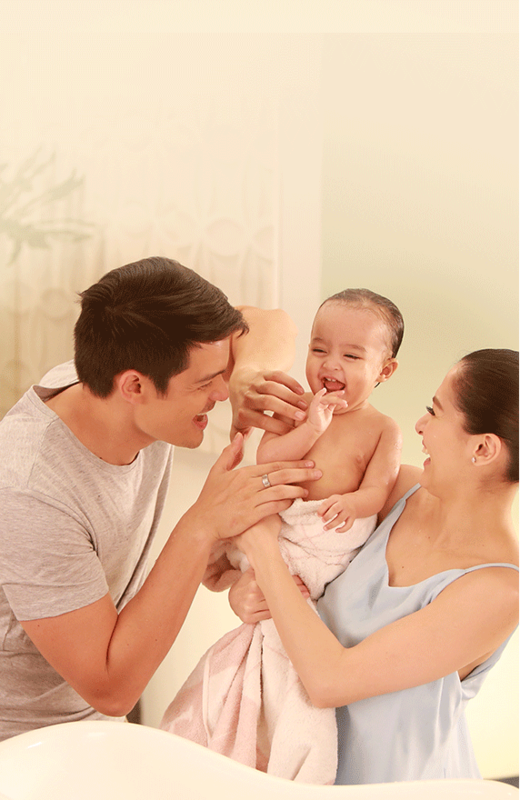 Sa kulitan with daddy, kakaiba ang development ni baby! Pero minsan, playtime can get rough sa skin. So make sure you help complete skin nourishment with JOHNSON’S® Milk range. Para skin feels strong and smooth, at laging ready for #Dadventures! Sa kulitan with daddy, kakaiba ang development ni baby! Pero minsan, playtime can get rough sa skin. So make sure you help complete skin nourishment with JOHNSON’S® Milk range. Para skin feels strong and smooth, at laging ready for #Dadventures! 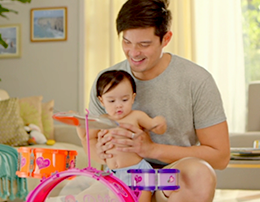 Bukod sa nagiging happy siya, mas nade-develop rin ang thinking ability ni baby during playtime. Like when he’s stacking blocks! He’s not just putting them on top of each other, but he’s carefully planning out what to do next. Before toddlers learn to walk, mga ilang beses rin silang matutumba. Lalo na when they start to walk in uneven surfaces. But it’s great practice! In time, your baby’s lower legs will build muscles and he will develop a sense of balance. Your baby will always be in motion as he tests his physical abilities. Lahat ng pwedeng tulakin, tutulakin. Chairs, furnitures, and stairs? Aakyatin! Especially during playtime, expect your little one to kneel, crawl and move a lot! But don’t you worry, mommy! Just be patient, and keep baby’s skin strong, as she tests her new independence. Para rough man ang kilos niya, soft at smooth pa rin ang skin. Your toddler will require more patience as he becomes interested to interact with others. Sa simula, he might push and hit his peers. But the more you let him play, the faster he’ll realize how his actions affect others. Magugulat ka na lang, best friend na siya ng lahat! You are your child's ultimate playmate. Kapag ikaw ang kalaro, any activity will seem more fun— kahit pa household chores ‘yan! Talk to her while she plays with you, and you’ll boost her language skills. At mas magiging open pa kayo sa isa’t isa. siguradong uulit-ulitin niya ‘yan! And that’s great because it builds his self-confidence and makes him comfortable around people. Keep your baby playing in different ways without the worries of getting scrapes and scratches. All you need is to give him complete skin nourishment! Play becomes more imaginative and complex ‘pag toddler na si baby. To foster his natural creativity, make sure you give him the time and space to try new things. Hindi kailangan ng bonggang toys! Sometimes, an empty box and crayons can take them places. Playing taguan with your kid will exercise his problem solving skills, as he figures out more and more places to search. Role playing with imaginary situations also teaches your child to think creatively. Pretend play with your toddler can help boost his working memory, since this activity involves remembering different roles— his and everybody else's. At sa paulit-ulit na paglalaro, he’ll eventually know which actions lead to the effect na gusto niyang mangyari. Your child will find many things interesting, and letting him go on Dadventures is a way to open up his world. It may be rough out there, but it’s nothing soft and smooth skin can’t handle! Why does toddler skin need special care? What is strong and smooth skin? 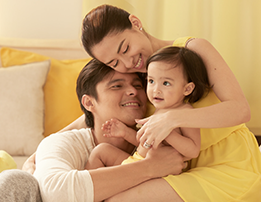 Say hello to the Dantes family – the family that plays together and stays together! moments are crucial to her development. At conf‌ident siya na Zia’s skin can handle it! 1 circle lang, soft and smooth skin na. Milk Bath is already enough for baby’s head-to-toe bath. Soft and smooth pa rin ang skin kahit mag-Dadventures! Hindi mahal ang milk bath, mommy! Sulit ito kahit araw-arawin. One small circle of JOHNSON’S® Baby Milk Bath is already enough for baby’s head-to-toe bath. Soft and smooth pa rin ang skin kahit mag-Dadventures!